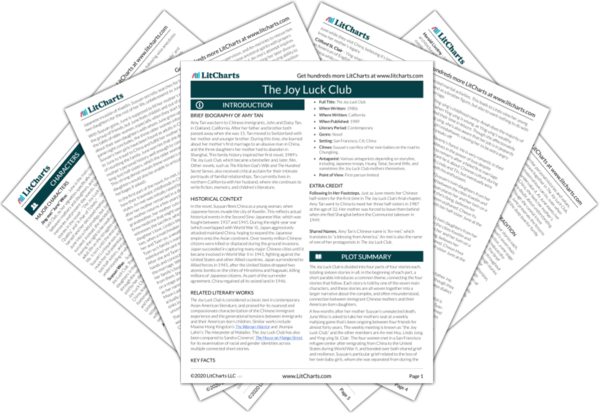 Instant downloads of all 945 LitChart PDFs (including The Joy Luck Club). 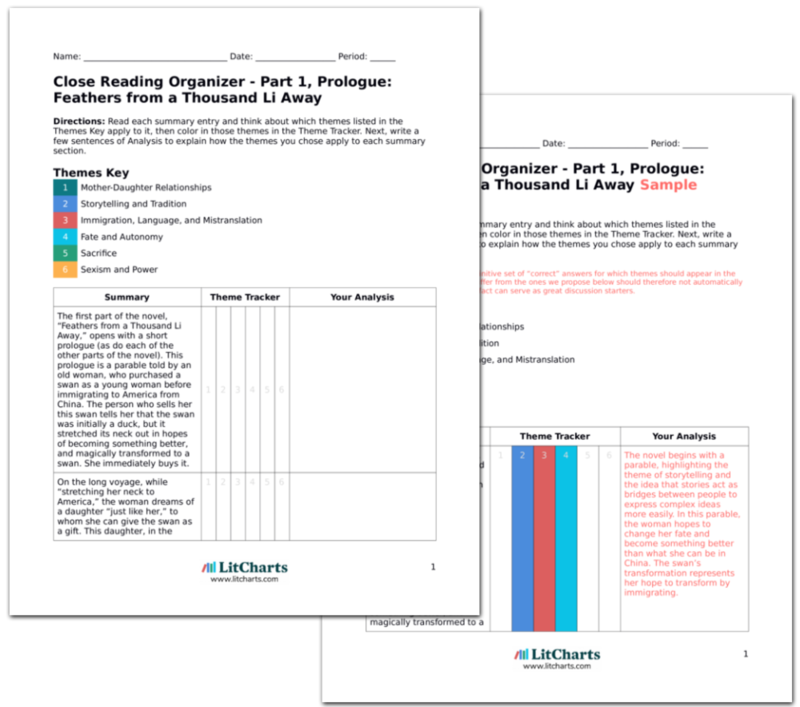 LitCharts assigns a color and icon to each theme in The Joy Luck Club, which you can use to track the themes throughout the work. Waverly takes Lindo out to lunch to tell her about her recent engagement to Rich Schields, but it goes poorly, as Lindo complains about Waverly’s edgy haircut and the restaurant’s service. Waverly thinks that she and her mother were destined to not get along, since their Chinese Zodiac signs make a bad combination. Lindo, as a Horse, is fated to be overly honest, while Waverly’s sign of a Rabbit is thin-skinned to criticism. Despite the genetic bond between mother and daughter, there is another complex relationship between predestined personality types in Chinese tradition. Certain personalities simply do not get along. Whenever Waverly tries to bring Rich up, Lindo changes the subject, so Waverly decides to bring her to Rich and Waverly’s apartment, where the evidence of a man’s existence is so obvious that Lindo can’t ignore it. The apartment is messy in a domestic way; “a home full of life and love.” Lindo steps over Rich’s running shoes and toys that Shoshana, Waverly’s daughter from her first marriage, left lying around. Even still, Lindo doesn’t comment on the co-habitation, only the apartment’s mess. Waverly’s insistence to make Lindo accept her American values – such as moving in with a man before marriage – is at odds with Lindo’s Chinese style of denial. Waverly craves her mother’s acceptance, which Lindo does not hand out easily. As said by Lindo before, the daughters of the Joy Luck Club do not think through their actions, and therefore don’t anticipate the extent of their consequences. Waverly thinks she can do anything as if life were all a game, but Lindo teaches her about repercussions and sacrifice. Waverly goes back to playing competitively a few weeks later, but has lost her confidence and is unable to strategize or hide her weaknesses from opponents. Though she continues to play for a few more years, her prodigious gift is gone, and Waverly retires from competition at the age of fourteen. Her mother’s ability to erode self-confidence haunts Waverly into adult life, coloring Waverly’s opinion of her romantic partners. Lindo openly disliked and criticized Waverly’s first husband who was also Shoshana’s father; by the time Waverly divorces him, she believes Lindo poisoned her marriage. Now with Rich, she’s worried the same negativity will pollute her happiness. This lesson shakes Waverly’s confidence because Waverly no longer believes she can beat anyone—not after she feels that her mother has beaten her. Lindo represents someone more knowledgeable and stronger-willed than she is. Rather than appreciate her mother’s insights, Waverly continues to see her as an opponent, which poisons their relationship. 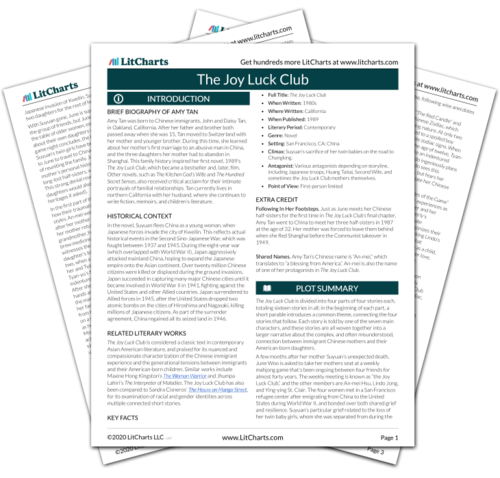 Get the entire The Joy Luck Club LitChart as a printable PDF. Waverly finally gets Lindo to acknowledge Rich through a sneaky plan: she first takes him to Suyuan and Canning’s house for dinner, then claims that Rich has never had better Chinese food. Lindo’s personal pride gets the better of her, and she invites Waverly, Rich, and Shoshana for dinner the next day. Waverly twists Chinese etiquette and tradition to her advantage, making her mother feel obligated to host someone she doesn’t want to. This manipulation of superstition echoes Lindo’s childhood cunning against Huang Taitai. The dinner is a disaster, as Rich breaks a number of Chinese etiquette rules, such as adding soy sauce to Lindo’s cooking and calling Waverly’s parents by their first names. Waverly is horrified by his behavior and has second thoughts about marriage. She then blames her mother being “the queen” of a chessboard, “relentless in her pursuit, always able to find [Waverly’s] weakest spots,” and being the reason behind her indecision. Even though he is a good man, Rich has no understanding of Chinese values, and mistranslates polite behavior. Rather than forgive him, Waverly internalizes her mother’s complaints and can’t see him objectively anymore. Waverly stays up all night stewing, then drives straight to Lindo’s in the morning to yell at her. When she arrives, Lindo is asleep, looking “innocent… defeated.” Waverly is seized with a fear that Lindo might be dead and shakes her awake, then breaks down in tears. Lindo reveals that she knew about the engagement and thinks Rich is fine. Waverly reconsiders all her assumptions about her mother, and suddenly understands her for the first time. Beneath her prickly exterior, Lindo has only wanted the best for Waverly, and has expressed her love in the only way she knows how to. When Waverly sees her mother’s unguarded expression, she realizes how similar they are, hiding behind walls of stoic strength; like mother, like daughter. She also discovers that she underestimated her mother’s compassion all her life—she did not realize that her mother could see past Rich’s cultural blindness to the good man underneath—and Waverly didn’t realize this because of her own misunderstanding of her mother’s sacrifice for her. Ogi, Alyssa. "The Joy Luck Club Part 3, Chapter 2: Four Directions." LitCharts. LitCharts LLC, 24 Jul 2015. Web. 23 Apr 2019. Ogi, Alyssa. "The Joy Luck Club Part 3, Chapter 2: Four Directions." LitCharts LLC, July 24, 2015. Retrieved April 23, 2019. https://www.litcharts.com/lit/the-joy-luck-club/part-3-chapter-2-four-directions.